Having an emergency fund is boring. You can think of a hundred better things to do with your money than have it sitting in a savings account doing nothing. You’re not alone. In fact, over 55 million Americans have no emergency fund at all. In other words, most people can think of something more exciting to do with their money than leave it in a bank account. But having an emergency fund is critical to your long term financial health. Heck, it is critical to your mental health too! Around 10 years ago, I bought my first house. I got in over my head and was living paycheck to paycheck. I had nothing saved in the bank, so I counted on my paycheck every two weeks. During that summer, I came home from work and my house was abnormally hot. I thought I had just forgotten to turn on the air conditioner since it had been cooler than usual the previous few days. Sadly, I did have the air conditioner turned on. It wasn’t working. I called up a repairman and found out that my unit needed to be serviced. Luckily the unit didn’t need replacing, but the repair still cost me $600. This was $600 I didn’t have. On to the credit card it went. Many other expenses were going on to my credit cards too. Suddenly I was stressed when getting my mail as I didn’t want a credit card bill to be in there. I tried to stop using my credit cards and only used my debit card. But my identity was stolen and they took $300 from my checking account before I caught on. Unlike with credit cards where you just ignore the fraudulent charges while the fraud is investigated, with a bank account, the money is gone until the bank completes its investigation. It was 3 long months until I got my money back. At the time the money went missing, I had to resort back to my credit cards to buy groceries and gas. The moral of this story is that these headaches and stress could have been avoided had I simply had an emergency fund. In this post, I am going to show you how to build your savings fast, where to park your emergency fund, and what emergency fund size is best. By the end of this post, you will have a healthy savings cushion and will be on your way to improved financial health and happiness. #2. How Much Money Do You Need? The first step in building your emergency savings is to actually open one up. But don’t make the mistake of going to your local bank. The reason to not park your emergency fund here is because the interest you earn on your savings will be next to nothing. And you want to earn money on your savings right? The best place to park your emergency fund is with CIT Bank. They are an online bank that pays one of the highest interest rates in the country. In fact, they pay close to 192% higher interest rate than your local bank! The account is free and works the same as an account at your local bank. To open your free account, click here. Now that you have your emergency savings account set up, you need to know how much money to put in it. Emergency fund size varies by person and life situation. If you are single and living with your parents, you don’t need a sizeable emergency fund. But if you own 2 houses, travel, and have a couple children, then the size of your emergency savings is going to be larger. The overall consensus is to look at your monthly expenses and multiply this number by 6. This will get you to 6 months worth of savings. For example, if your monthly expenses average out to be $1,500 then you need a minimum of $9,000 in your savings account. Remember this is the minimum amount. I like to recommend 9 months of savings. The reason is because you never know what life will throw at you, and many times when one thing goes, multiple things go. By having a larger sized emergency savings, you have added peace of mind that should something happen, you have the cash to cover it. After you do the math and see how much money you need in savings, your jaw might hit the floor. Nine months of expenses is a lot of money. And for many of you, you think it will take decades to save this amount of money. Some of you might even give up thinking it is impossible. Before you throw in the towel, know that the best way to build your savings is to break it down. For now, forget about needing 9 months worth of expenses. Just focus on saving $1,000. This makes the goal a less scary. How do you get $1,000 fast? First you clean out your house. I’m sure you have many things you don’t use. In some cases, you might have never even used them in the first place. Sell it all. For electronic items, movies, video games, cell phones, etc. use Decluttr. They pay the highest amount for these things. All you have to do is go to their website and get an estimated value for your stuff. If you decide to sell, they will send you a box that you put your things into and ship back at no cost to you. Once they confirm the items, you get paid. You can try out Decluttr by clicking here. Another option is to take online surveys. My favorite is Springboard America. Just take 30 minutes a day to take surveys and you will begin to make some extra cash. You can click here to get started. Finally, look into Swagbucks. This website offers many ways to earn extra money. You can take surveys, watch videos, play games, and more. You can even earn cash back when shopping online. New users get $5 when you open your free account by clicking here. 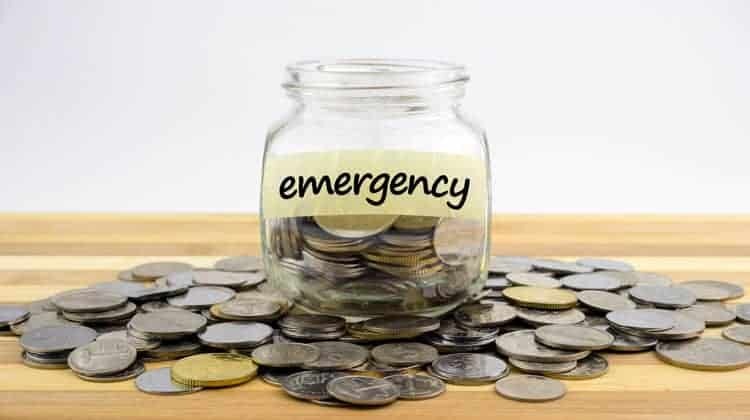 By using these tips and limiting your spending a bit, you can quickly fund your emergency savings account with $1,000. Once you have your first $1,000 you can focus on getting to the next $1,000 and then the next, and so on. By focusing on just $1,000 at a time, you stay motivated to reach your goal and you won’t get overwhelmed. Before you know it, you will have reached your ideal emergency fund size. While cleaning out your house and taking surveys is a great way to begin building your savings, there are many other things you can do as well. By using some of the quick savings plans below, you will be amazed at how quickly your emergency fund grows. Earlier I told you to open your savings account with CIT Bank. Here is why. 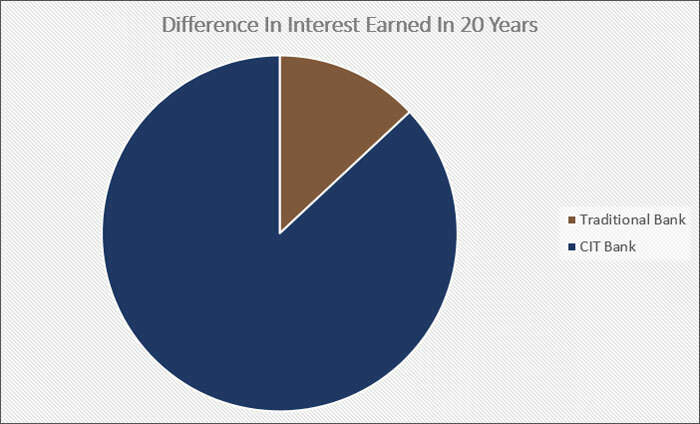 When you earn a higher interest rate, you need to save less money. This is because your money will compound faster with a higher interest rate. For example, let’s say you start off with $1,000 in your emergency fund. If you earn 0.05% interest, which is typical at your local bank, you will earn $0.50 in 1 year. If you put this money in a CIT Bank savings account and earn 2.45% interest, you will earn close to $25 during that same year. By simply choosing a bank that pays more interest, you need to save close to $25 less. And this is just in the first year! Let’s say your ideal emergency fund size is $10,000. If you open a savings account with $1,000 and save $500 a year, it will take you 19 years to reach your goal. During this time, with your local bank you will earn $554 in interest. With a higher interest paying savings account, you will earn $3,691 in interest. The result is you reaching your savings goal years earlier. Be smart and pick a bank account that pays a higher interest rate. In the very short term, it might not seem like earning more on your money matters. But over a longer time period it does. Don’t cheat yourself out of more money. Click here to get started with CIT Bank. Once you have picked a bank account that offers a higher interest rate, it is time to start saving as much money as you can. My favorite quick savings plan is to use a 30 day savings challenge. This works by having you cut out one expense from your monthly spending and put that money into your emergency savings. For example, for one month you give up eating out. This saves you $250 which you put into your savings account. The next month you give up buying any new clothes. This allows you to save $100 in your savings account. By using various 30 day saving challenges, you increase the amount of money you can save and rapidly build up your savings. As great as using 30 day savings challenges are, you need to add in other tricks to build your savings fast. How to save thousands on groceries: learn how to slash your grocery spending and save thousands over the course of a year. 76 simple hacks to save money: learn simple tricks you can do to increase your emergency fund size fast. 9 hacks to save on cable: your TV and internet bill is likely sky high. Here is how to make this expense affordable. 59 dumb ways you waste money: Learn the dumb things you do that cost you money and learn how to stop. By using these tricks, you can build your savings fast and start seeing the power of compound interest. One of the largest monthly expenses you may have is credit card debt. If you have debt, you need to make it a point to pay it off. The reason is simple. The lower your monthly expenses are, the smaller amount of emergency savings you need. For example, let’s stay your monthly expenses are $1,500. As we saw, 6 months of savings is $9,000. But if $300 of this amount is credit card or student loan debt that you pay off, suddenly your monthly expenses are $1,200 a month which means you need to save $7,200 to reach your savings goal. That is a difference of close to $2,000! And the more debt you have, the bigger the impact is when you pay it off. If the idea of paying it off sounds overwhelming, then at least work on reducing the monthly expense by paying it down or refinancing it. For example, for student loans you can refinance with Credible. By refinancing your student loans, you reduce the interest rate, saving you money over the long term. And in many cases, when you refinance you lower your monthly payment too. The process is free to see how much you can save, so there is nothing to lose. You can click here to learn more about Credible. The same idea applies to credit card debt as well. And you can refinance this debt with Credible too. In this example, you would take out a personal loan. The money would pay off your high interest rate credit card debt and you would be left with one monthly payment at lower interest rate and a lower payment amount. Here again is the link to try Credible for free to see how much money you can save. The final step in building your savings fast is to increase your income. You have many options when it comes to making more money. The absolute best is to focus on your career. By making sure you work hard, you can earn the highest salary possible. But this takes time. Because of this, I am going to focus on easier ways to make money on the side. In most cases this income won’t replace your full time earnings, but you can make a lot money with these side hustles. When you work with Instacart, you grocery shop for others. Simply complete their shopping list, prepare the groceries for delivery and you are done. The work is easy and the pay is good too. And to double dip while grocery shopping and earn more money, you need to download the app Shopkick. This app lets you earn points for scanning barcodes. Collect enough points and you earn free gift cards. To get started with Shopkick and earn 250 bonus points after your first scan, click here. To get started making money with Instacart, click here. You can make money driving others with Uber. I have a friend that picks people up on his way into work that are along his route. His thinking is that he is driving that way, so might as well make money doing it! The amount you earn by partnering with Uber varies, but it is a viable option to making extra money. You can click here to start the application process. If driving others isn’t for you, have you considered delivering food? When you partner with Uber Eats, you do just this. No need to make small talk with your passenger. Just pick up and deliver food. How easy is that? You can click here to start the Uber Eats application process. Amazon is an excellent place to make money. And they make it easy with their FBA program. All you do is list your items for sale on Amazon and ship your items to one of their warehouses. When the item sells, Amazon will prepare the order and ship it. They will then pay you your profit. In the event of a return, Amazon handles this too. When I did this, I was making $500 a month without a lot of work. The problem was getting started. It took me a good 6 months to build up to this level. The good news is you don’t have to wait this long. Here is a great guide on getting started with Amazon FBA that will have you making money in no time. You can get access to this free course by clicking here. These are just a few ideas to get thinking about how to make some extra money to build your emergency savings fast. The key is finding a few that excite you so you can build your emergency fund as quickly as possible. Having an emergency fund is critical to your financial health. In fact, it should be one of your first steps in the process to improving your finances. Once you have your emergency savings set up and funded, you can focus on tackling your debt and building long term wealth. But it all starts by having a solid financial foundation. Having the right size emergency fund is the foundation you need. The sooner you accept this and build up your emergency savings, the sooner you can change your financial outlook for the better.